Prime Minister Manmohan Singh today said the millennium development goals of halving the proportion of people living below the poverty line by 2015 will be achieved going by available figures even as he admitted there were flaws in the delivery mechanism and constraint for funds. The Catholic Bishops Conference of India (CBCI), the highest body of the Catholic Church in the country, has appealed to the NSCN (I-M) and other Naga factions to sink their differences for the sake of long-term peace in the region. The Kanchi Shankaracharya will spend the New Year’s eve in jail as his judicial remand was today extended till January 6, 2005, in both cases he is facing. The remand extension proceedings were conducted through the video-conferencing facility available at the courts and the Vellore Central Prison. The Election Commission has appointed six special observers for Haryana, Bihar and Jharkhand to supervise the Assembly polls there scheduled in February. Mr Sayan Chatterjee and Mr A.C. Shukla will be special observers for the crucial Assembly polls in Bihar. The ruling Samajwadi Party (SP) today retained the Mainpuri Lok Sabha seat and wrested the Akbarpur (Reserved) seat from the BSP in the December 20 by-elections in Uttar Pradesh. Hindustan Aeronautics Limited intends to pitch Dhruv, advanced light helicopter (ALH), to the Malaysian Air Force (MAF) as a cost-effective replacement for the MAF’s ageing helicopter fleet, HAL Chairman Ashok Baweja said here today. The Congress may be constrained in making tall promises in next year’s Haryana Assembly poll but its election manifesto will pledge expeditious action on the charge sheet it has already prepared against the Chautala government. It is only days since the elections to the three states of Haryana, Jharkhand and Bihar were declared but Congress leaders have already begun lobbying for tickets for their relatives. This is particularly so in the case of Haryana and Jharkhand where the Congress enjoys a clear edge over its opponents. The New Delhi district police today claims to have arrested the main accused in the MP flats theft case and recovered the mobile phone stolen from one of the MPs flats. Mangulu Badtia’s body was lying in a jungle, but not unattended. A herd of eight tuskers were keeping vigil on the body of the 60-year old man, who was trampled to death by an wild elephant today. The first North India Physiotherapy Conference — “Synergy-2004” — was organised at Sardar Bhagwan Singh PG Institute of Biochemical Sciences and Research, Dehra Dun, on December 19 and 20. As many as 800 students from 22 colleges throughout the country participated. The Directorate of Revenue Intelligence (DRI) seized fake currency of Rs 46 lakh and arrested four persons, including two Bangladeshi conduits, at a hotel in the Paharganj area of Central Delhi on Tuesday. The Central Board of Secondary Examinations (CBSE) today announced the dates for conducting the Secondary School Examinations and Senior Secondary School Examinations for the year 2005. The examinations will begin on Tuesday, March 1, 2005 at 10.30 am for Class X students and wind up on March 24. The government today virtually rejected the demand of journalists to set up a new wage board allegedly under the pressure of newspaper managements saying that it was “too early” to set up a new board,. Thirteen persons died after consuming spurious liquor at a slum in N.M. Joshi marg in south Mumbai here, the police said. Over 15 persons were rushed to Nair hospital late last night after they complained of vomiting and dizziness and other symptoms related to consumption of methanol alcohol, hospital sources said. Pamper your shoes at a unique laundry in Mumbai. “As of now the data available suggests that we will be able to meet the target set in the millennium development goals for 2015,” the Prime Minister said intervening in the Rajya Sabha during Question Hour. “I would not be correct to say that there is no scarcity of funds or there is no scope for improvement of the delivery system,” he said adding the Planning Commission was currently engaged in an exhaustive exercise on the mid-term appraisal of the 10th Five-year Plan. He said when this document would be available, it would enable to focus sharply on things to be done to make the plan programme effective. Mr Manmohan Singh said there was scope for improving delivery lines. The Prime Minister said Parliament could have exhaustive deliberations on the mid-term plan appraisal document after it was tabled in Parliament. To a question on employment opportunities, the Prime Minister said a commission under noted economist Arjun Sengupta was looking into the activities in unorganised sector where 93 per cent of the labour was engaged. The Prime Minister said after the Arjun Sengupta Commission comes out with its report, the government would be able to look at employment opportunities in the urban sector as well. He said the National Common Minimum Programme of the UPA does not see the rural sector and the urban sector separately. Earlier, Sushma Swaraj (BJP) and Sanjay Nirupam (SS) wanted to know about employment programmes for the educated unemployed. There was a mild uproar when Labour and Employment Minister K. Chandrashekhar Rao said the government looked at employment opportunities in general and linked it with the growth rate of the economy and that there were no specific schemes for educated youth as such. Mr Rao said the opportunities in small scale sector and self-employment would take care of the interest of the educated unemployed. The Catholic Bishops Conference of India (CBCI), the highest body of the Catholic Church in the country, has appealed to the NSCN (I-M) and other Naga factions to sink their differences for the sake of long-term peace in the region. It has also asked the Union Government to “go to the root of the problem” and undertake development on a war footing to address the socio-economic concerns of the Nagas. Donning the role of an “honest broker”, the CBCI has invited all parties to the dispute to come to the negotiating table. “The Christian leadership wishes for an enduring peace in the region,” Father Babu Joseph Karakombil of the CBCI told The Tribune. “We want to supplement the government’s efforts for ending the long-drawn struggle,” he said about the role of the church. The church, which has played a key role in holding the fragile peace in the predominantly Christian state of Nagaland, has called a meeting of Christian leaders, intellectuals and representatives of civil society in the first week of January in Imphal to forge a consensus and to give an impetus to the peace talks. “We want to promote peace in the longer term. We do not want a piecemeal strategy,” Father Joseph observed. The call for peace would find a mention in the customary statement released by the CBCI ahead of Christmas. He said that disturbance in the North East was of special concern to the Catholic Church and the statement would pray for peace and friendship on the occasion of Christmas. “A well-callibrated response is called for from the government that addresses the legitimate aspirations of the people,” he added. Welcoming the efforts of the government and the church to find an early settlement of the problem, Ms Khesheli Z. Chishi of the Naga Mothers Association said that it was imperative that the talks were “transparent” and that a “consensus” emerged soon. Meanwhile, the Madras High Court adjourned the hearing on a petition seeking bail for the seer in the Radhakrishnan attempt-to-murder case for further arguments to December 27. Kancheepuram Judicial Magistrate G. Uttamarajas went to the Chengalpattu Sessions Court to complete the formalities in the Sankararaman murder case while Ms G. Uma Maheswari, Metropolitan Magistrate at Saidapet in Chennai, also extended his remand till January 6, 2005, in the Radhakrishnan attack case. The Madras High Court commenced hearing on a petition seeking bail for the Hindu pontiff in the Radhakrishnan case. Mr Justice R Balasubramaniam later adjourned it till December 27 on a request by senior counsel for the state, Mr K.T.S. Tulsi, who cited a provision stating that there was a legal restriction on an accused being given bail if there was reasonable ground to believe he has committed an offence punishable with death or life imprisonment. This was applicable in this case also, he pleaded. Under the same provision the seer was denied bail in the Sankararaman murder case earlier by the same court. Defence counsel Satyanarayanan sought bail on the ground that the incident was not a recent one and that it had taken place two years ago. He said the petitioner would not tamper with evidence and would abide by any conditions imposed by the court, if given bail. He also expressed surprise about the assailants being identified by the victims at an identification parade held after two years and the weapons allegedly used in the attack being seized from under a water tank recently. However, in a counter-affidavit, the police alleged that the attack on Mr Radhakrishnan, his wife and their housemaid was a “calculated, well-designed and gruesome attempt to murder, perpetrated through rowdy elements on payment of money”. It claimed that the Shankaracharya had surmised that Mr Radhakrishnan was the author of many letters and pamphlets about his alleged “unholy activities, business dealings and deviations from the religious path”. The affidavit alleged that the seer had entered into a conspiracy with Ravi Subramaniam, who is still at large; Appu and Kathiiravan, both arrested, to attack Mr Radhakrishnan a week before the incident. It stated that Kathiravan engaged Meenakshisundaram, alias Sundaram, to hire five others to attack the victim on September 20, 2002, in Chennai. Justifying the delay in the investigation it stated the police obtained concrete material only last month after the arrest of the accused in the Sankararaman murder case. The prosecution also argued that there was nothing illegal in recovering weapons long after the incident or in conducting an identification parade after two years. The prosecution opposed the bail of the seer in this case as he was likely to “erase evidence or deter evidence being placed before the court and create a non-conducive atmosphere for further investigation”. Meanwhile, the Sessions Court at Chengalpattu, which has jurisdiction over Kancheepuram, dismissed the bail petitions of eight suspects in the murder case, including one from Kathiravan, a key accused who implicated the Shankaracharya in his confessional statement. Mr G.S. Patnaik and Mr Afzal Amanulla will oversee assembly elections in Jharkhand and Haryana respectively, EC sources said. Two more special observers, one each for Jharkhand and Haryana would be named shortly, the sources said. Meanwhile, JD (U) leaders led by party President George Fernandes today met the Chief Election Commissioner and appealed for holding the forthcoming Assembly election in Bihar in a single phase to prevent “misuse” of government machinery by the ruling RJD. “We told the Election Commission that single-phase polls would ensure that impartial elections are held as the ruling party will not be able to misuse the government machinery in its favour,” senior JD(U) leader Nitish Kumar told reporters after the meeting with CEC T.S. Krishnamurthy here. “Polls spread over three phases will help RJD in facilitating movement of their muscle power in different parts of the state,” Mr Kumar said. He also alleged that the RJD would ensure that sensitive poll booths would be manned by those government and police officers who are partisan to their party. He quoted the commission as having said the dates of the polls have been scheduled as per the availability and deployment of the para-military forces. In Akbarpur, once a stronghold of the BSP, ruling party nominee and Minister of State for Fisheries Shankh Lal Manjhi defeated his nearest BSP rival Tribhuvan Dutt by over 96,000 votes. It is for the first time that an SP candidate has won from the seat, which was represented by former Chief Minister and BSP supremo Mayawati for a record three times in 1998, 1999 and 2004. SP candidate Dharmendra Yadav, who is nephew of Chief Minister Mulayam Singh Yadav, won the Mainpuri seat defeating his nearest BSP rival Ashok Shakya by over 1,79,713 votes. Both Congress and BJP candidates were unable to save their sureties. On November 11, the Election Commission had countermanded the Mainpuri by-election held on October 13 following complaints of large-scale rigging. By-election for Akbarpur were also postponed from October 13 after detection of technical flaws in the notification. Polling for both the Akbarpur and Mainpuri seats was held on December 20 on a peaceful note. The Mainpuri seat was vacated by Samajwadi supremo and Uttar Pradesh Chief Minister Mulayam Singh Yadav who chose to stay back in the state. 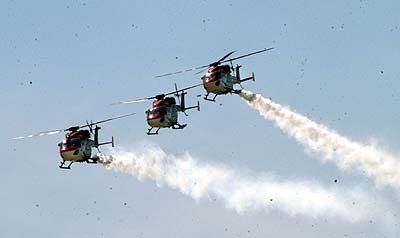 HAL showcased Dhruvs to the visiting Malaysian Prime Minister, Mr Abdullah Ahmed Badawi, with aerobatics display flown by the ‘Sarang’ team of three Dhruvs, led by Wg Cdr Hari Nair. Also featuring in an air display was the intermediate jet Trainer (IJT) flown by HAL Chief Test Pilot Sqn Ldr Baldev Singh (retd) and the light combat aircraft (LCA) Tejas flown by Wg Cdr Vikram Singh. “I am very happy to be here, and I hope aerospace cooperation between the two countries goes forward,” Mr Badawi, accompanied by a large delegation, said after the air display. “It was a golden opportunity to show them the range of excellent products that we have. We are pushing Dhruvs as they have already achieved certification,” Mr Baweja stated. The Sarang team is also slated to perform next month in the United Arab Emirates (UAE). HAL already has a relationship with the MAF as it provides spare parts and maintenance support to their fleet of Alouette helicopters (Chetak in India) and also supports their MiG-29 fleet with spares from HAL’s Mig complex in Nasik. HAL also plans to pitch for upgrades of the MAF’s helicopter fleet as HAL is already involved in upgrading several of the Indian Chetaks and Cheetahs. The Malaysian Prime Minster also visited the corporate headquarters and campuses of Biocon and Infosys and the Indian Institute of Science. The Haryana election manifesto committee, headed by Mr Birendra Singh, has met once but its members are learnt to be clear that if the Congress comes to power it will opt for a fast-track police enquiry against the Chautala government, similar to Punjab Chief Minister’s action against his predecessor, Haryana Congress sources disclosed today. At the same time, the Congress is also mulling over the possibility of handing over the charge sheet to the courts for suo motto action. However, the Congress is not planning the constitution of an enquiry commission to probe the corruption charges against Chief Minister Om. Prakash Chautala since it is a time-consuming process, the sources added. Having got strict instructions that it should not go overboard in making promises, the election manifesto panel is unlikely to announce populist measures like free power and waiver of farmers’ loans. It is likely to promise uninterrupted and affordable power supply and also explore ways of reducing the debt burden of farmers, pegged at around Rs 4,000 crore. Among the alternatives under consideration are the reduction of interest rate, waiving the total interest amount or application of NABARD interest rate. In this case, the poll panel is studying the party’s Lok Sabha election manifesto, which contains an ambiguous formulation on this issue, stating that it will try to reduce the debt burden of farmers to the extent possible. It was stated that the Congress will not raise the emotional pitch on the SYL canal controversy and will instead play down the issue on the assumption that the Supreme Court has already decided the case in Haryana’s favour. The party is expected to assure the electorate that it will mount pressure on the Centre and the Punjab Government for the early implementation of the apex court’s orders. Realising that few people read a party’s election manifesto, the Congress has, therefore, decided to publicise its salient features through the electronic and print media in Haryana for next February’s Assembly poll. This will be in addition to the party’s poll campaign. Meanwhile, Mr. Birendra Singh, convener of the Haryana manifesto committee, has identified specific subjects for inclusion in the manifesto and this task has been entrusted to seven sub-groups. These are: Congress contribution to Haryana’s development (Randeep Singh Surjewala), agriculture, power, forests and irrigation (Tara Singh), trade, infrastructure, industrial policy and transport (Harpal Singh), investments, fiscal management and economy (Ajay Singh), education and health (Ram Prakash), SC and ST, minorities, youth affairs (Kartari Devi) and unemployment, rural and urban indebtedness (Dharampal Mallik). The MPs from the states, it is reliably learnt, are heading this list. Lok Sabha MP Avtar Singh Badhana is stated to be pitching for a ticket for his wife from the Mewla Maharajpur assembly constituency. His colleague Bhupinder Singh Hooda is stated to be pushing his wife’s case while Rao Indrajeet Singh is learnt to be lobbying for his wife or his brother for the Jatusthana seat. Haryana PCC chief Bhajan Lal is, of course, a contender from Adampur which he represents at present. His one son Kuldeep Bishnoi is a Lok Sabha member while his other son Chander Mohan, a sitting MLA, is also in line for a ticket. It is the same story for Jharkhand. Its Lok Sabha member from Dhanbad Chandrashekhar Dube and Phurkan Ansari from Godda have put in a word for their sons. PCC chief Sushila Kerkata, who represents Khunti, also wants a ticket for her son while Union Minister Subodh Kant Sahay is lobbying for his brother and Mr Rameshwar Oraon, MP from Lohardagga, also wants a relative accommodated. In addition, all the newly-appointed seven vice-presidents of the Pradesh Congress Committee are seeking tickets for themselves. AICC sources said if this list of aspirants is anything to go by, it would appear that most of the seats in Jharkhand have already been grabbed. Deputy Commissioner of Police (New Delhi) Anita Roy said the accused has been identified as Rinku alias Kamal. The police has recovered the stolen mobile phone from his possession. Earlier, the police on Monday arrested another person involved in the burglary case. The accused persons had broken into two flats belonging to Tamil Nadu MP K. Nachiappan and West Bengal MP Dinesh Trivedi. They also tried to break into houses of three neighbouring MPs, but had to flee as some people spotted them. Badtia, a resident of Gokarnapur village under Digapahandi police station of Ganjam district, had gone to the jungle this morning to fetch some banana leaves when he was killed by a tusker, official sources said. A herd of eight elephants then arrived on the scene and surrounded the body and the villagers could not retrieve the corpse. Forest officials from Digapahandi and Berhampur, besides the local police officials, have rushed to the spot. During the conference Dr Deepak Kumar, BPT/MPT/ CMT (Australia), conducted a symposium on “Mulligans mobilisation techniques”, which is an effective manual technique adopted by physiotherapists for relieving pain and improving functional abilities in various orthopaedic and other disorders. The conference had delegates from Uttaranchal, Haryana, Meerut, Delhi, Punjab, Madhya Pradesh and Ghaziabad. Acting on specific information, the DRI sleuths seized the fake currency, in the denomination of Rs 500, which was sent from Pakistan for circulation in the country. An official said the notes were hidden in false bottom cavities of two big suitcases brought by the Bangladeshi nationals, Mohammad Rashid and Nurun Nahar Lovely. The two persons who came to receive the consignment — Abad Ali and Imam Raza — were also arrested by the sleuths. All four were booked under provisions of the Customs Act. Preliminary investigations revealed that the two suitcases were given to Nurun by a resident of Shahjahanpur in Dhaka for delivery in Delhi. For the Class XII students, the examinations will also begin on March 1, but will conclude on April 1. It might be “too early” to constitute a new wage board for journalists and non-journalists in the newspaper industry in view of the fact that the Manisana Wage Board submitted its recommendations in 2000 only, said Labour and Employment Minister K Chandrashekhar Rao in a written reply to the Rajya Sabha. He said the last wage board — the Manisana Wage Board — had submitted its recommendations in July 2000, which were accepted by the government and notified for implementation in December that year. “Therefore, it may be too early to constitute a new Wage Board for Journalist and non-Journalist workers in the newspaper industry,” the minister told the House. He also said The Working Journalists and other Newspaper Employees (Conditions of Service) and Miscellaneous Provisions Act, 1955, did not provide for any periodicity in setting up a new wage board. The remaining two patients were still undergoing treatment at the hospital, the sources said.